You might think the term “economic Armageddon” sounds extreme and isn’t a situation that you’ll ever have to encounter in your life. But take a minute to think about how many cities — and even countries — have either declared bankruptcy in recent years or have been on the verge of doing so. Think about the fallout in places like New Orleans after a major natural disaster. Think about cities like Detroit that don’t even have basic amenities like running water because of the local financial crisis. It is not so far-fetched to think that you might be in a situation one day where your financial resources are very limited or your money may even become worthless. This can happen even in the United States, one of the richest countries in the world. Investments include much, much more than stocks and bonds. To lower your risk and maximize your gains, you need to diversify your portfolio and make the right choices. The right coin shop can give you investing advice about things like buying and selling Arizona gold coins, bullion, bars, buy silver, buy gold, jewelry and more. You’ll learn about the best investment choices, potential profit margins, the right times to buy and sell, and more. Bullion is a smart investing choice because precious metals like silver and gold hold their value over time, lowering your risk. Bullion is also a smart choice because it’s a physical good. Even if paper money loses all value in an economic Armageddon, bullion will not. No matter what form it takes, it is still gold and silver, and those metals will always have value. A quality Glendale coin shop will have plenty of bullion on hand to sell you. Bullion can include silver and gold bars, but it usually consists of smaller sizes. These smaller sizes are easier to sell, providing some flexibility for your portfolio. Silver and gold coins have the same benefits of bullion, but they are easier to liquidate since they come in smaller sizes and values. Coins have the added benefit of collectible value, which can mean there is more demand for them across financial markets. In other words, if you can’t sell them at home, you may find a buyer for them in another state or another country. A quality coin shop will have a large selection of gold and silver coins available for sale. You should find coins from a wide time frame, and you should find coins of varying values. 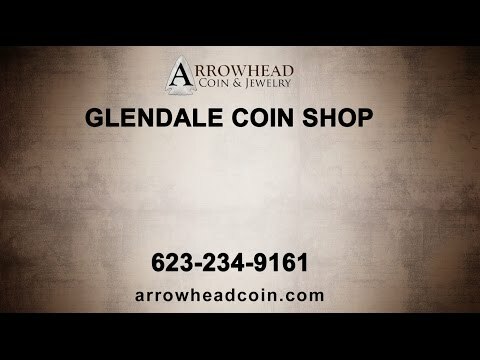 Arrowhead Coin & Jewelry has been serving residents in Glendale for years. Our expert buyers can give you seasoned advice about buying and selling gold coins, silver and bullion. We can help you make smart choices for your financial future, even if an economic disaster were to strike. We also buy coins and bullion, giving you opportunities to turn a profit or to raise the money to expand your investments. Stop in to our coin shop today to learn more about these exciting investment opportunities and to start creating a portfolio that will protect you and your family.